Part One of this highly regarded method includes basic music theory and details Evo's easy 4-step method. 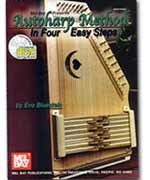 Part Two includes rhythm strumming instructions, melody chord changes, and lyrics to 18 well- known American folk songs and southern fiddle tunes in the keys of G, F, C major, and A modal (keys that are provided on standard 12, 15 and 21 bar harps). Also included are instructions for transposing to other keys. All songs are included on a solo performance CD for the purpose of ear training and accompaniment.